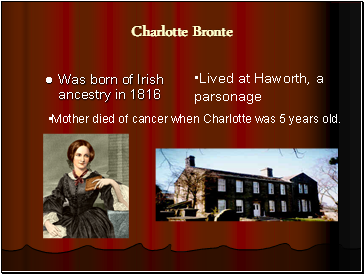 Mother died of cancer when Charlotte was 5 years old. 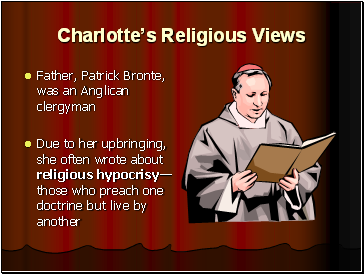 Charlotte had four sisters and one brother. After their mother’s death, Brontë and her sisters were sent to the Clergy Daughters’ School. 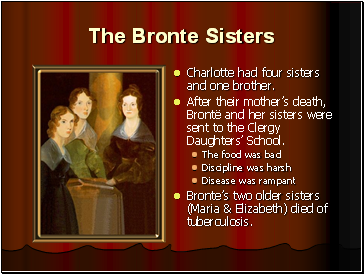 Bronte’s two older sisters (Maria & Elizabeth) died of tuberculosis. 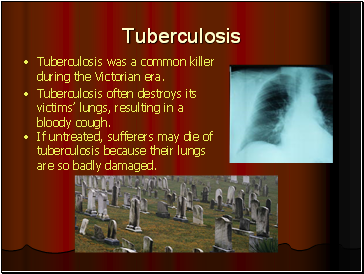 Tuberculosis was a common killer during the Victorian era. Tuberculosis often destroys its victims’ lungs, resulting in a bloody cough. If untreated, sufferers may die of tuberculosis because their lungs are so badly damaged. The Clergy Daughter’s School at Cowan Bridge would became the model for Lowood, the fictitious girls’ school in Jane Eyre. 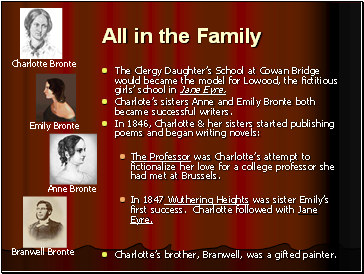 Charlote’s sisters Anne and Emily Bronte both became successful writers. The Professor was Charlotte’s attempt to fictionalize her love for a college professor she had met at Brussels. In 1847 Wuthering Heights was sister Emily’s first success. 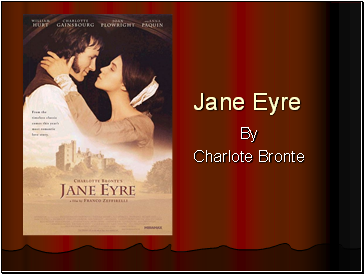 Charlotte followed with Jane Eyre. Charlotte’s brother, Branwell, was a gifted painter. 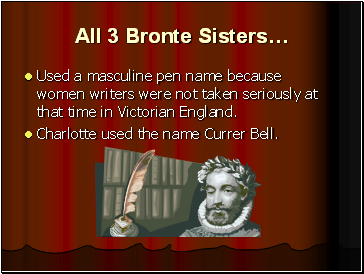 Used a masculine pen name because women writers were not taken seriously at that time in Victorian England. Charlotte used the name Currer Bell. 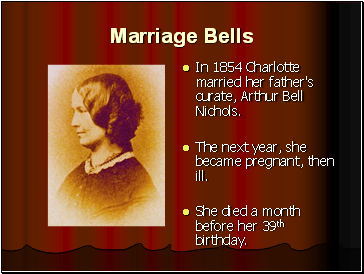 In 1854 Charlotte married her father's curate, Arthur Bell Nichols. The next year, she became pregnant, then ill.
She died a month before her 39th birthday. 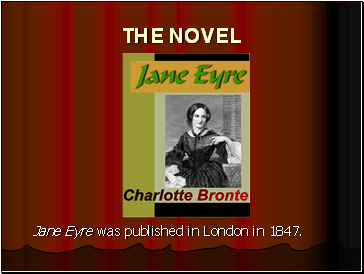 Jane Eyre was published in London in 1847.